Because April is National Card and Letter Writing Month and Mother's Day is on the horizon, I thought now would be an ideal time to feature greeting card subscription services. Did you know there is such a thing? Not only is it convenient to have a a handful of high quality cards on hand, but a subscription is also a nice way to be introduced to new trends and color palettes in the stationery world. Here are a half dozen services that have been on my radar - in alphabetical order, as I truly don't have a favorite. If you have a card subscription services to recommend, feel free to leave a link in a comment below. 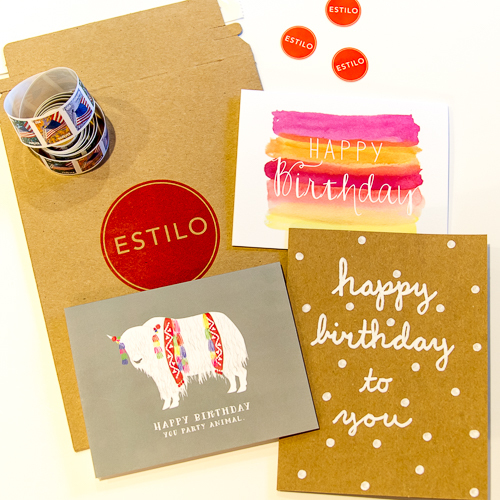 Estilo Cards features greeting cards designed by independent artists from around the U.S. Each month a curated selection of three (and sometimes four) high quality cards arrives with envelopes, Forever stamps, and envelope seals. The company is located in Austin, Texas and was founded by Julian Mardirosian just this past September. You'll receive an assortment such as a birthday, thank you, and blank card. When there is a holiday in that month, one or more of the cards will pertain to it. I'm a longtime fan of b-spired's unique, laser-cut wood cards and was impressed to see the subscription often includes one. Estilo also partners with MD Anderson Children's Art Project and sometimes features a card their kids create in the boxes. Subscriptions are on a monthly recurring basis for $18/month. Multiple month subscriptions are offered at a discount. A special offer for All Things Paper readers: Use code PAPER20 for 20% off on one time plans (3, 6, 12 month). This offer runs through 4/30/15. 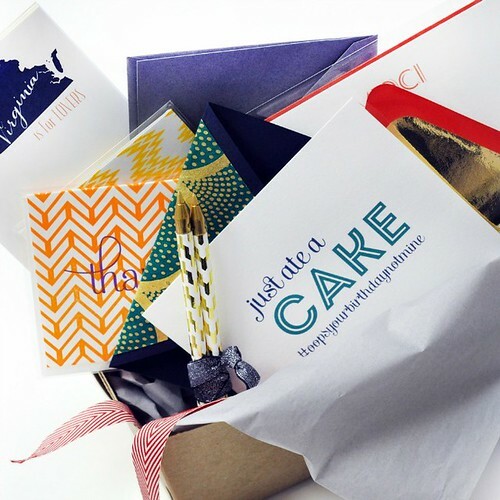 Haute Box is brought to you by Sarah Meyer Walsh and Erin Miller, owners of Haute Papier in Washington, D.C., and designers and printers of fine letterpress stationery. They promise that your Haute Box will be the happiest thing you get in the mail that day! Cards are always included in each box, but recipients might also find fun paper items like coasters, confetti, or washi tape. Haute Box is a quarterly subscription service priced at $20/quarter; sign up for however many quarters you like. If you prefer to order through Etsy, you can do that here. A special offer for All Things Paper readers: Use code ALLTHINGSPAPER20 to save 20% off most items at Haute Papier (not including Haute Box, gift certificates, or foil stamped gift tags). 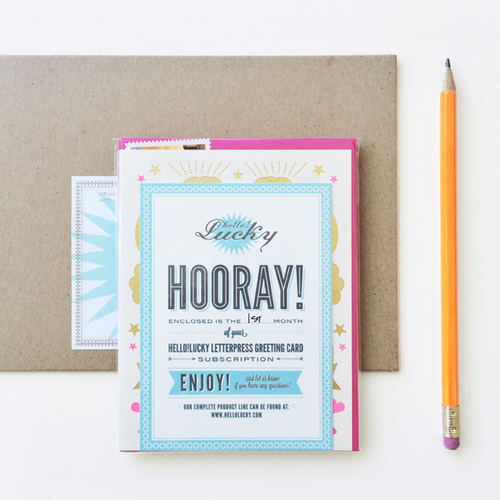 Hello Lucky's Monthly Card Subscription from sisters Eunice and Sabrina Moyle in San Francisco allows you to choose the number of months you would like to receive a set of three all new or best-selling letterpress cards printed by Eggpress at a cost of $12/month. Each delivery includes matching envelopes that are pre-stamped. Hello!Lucky cards are colorful and often punny. The company sells cards individually online and in many stationery and craft stores, boutiques, and museum stores around the country and abroad. The Mindful Art Subscription is a $12/month subscription from Holstee, a company in Brooklyn that also produces inspiring posters and prints. 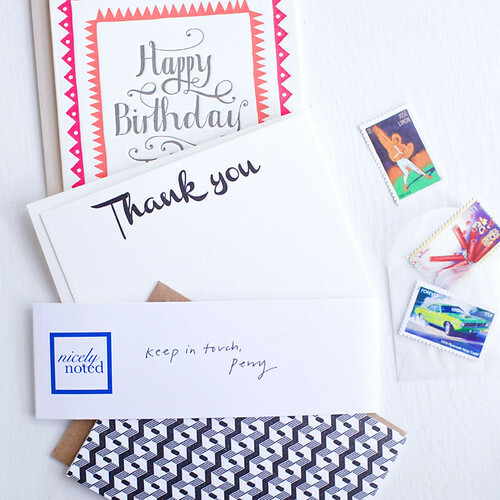 You will receive one letterpress card with a stamped envelope each month; the subscription can be cancelled at any time. Included is a description of the card art and why it was chosen. It is the company's intention that each card accentuates the important things in life. Six or twelve month gift subscriptions are available, as well as a reclaimed wood frame or card stand to display a card. 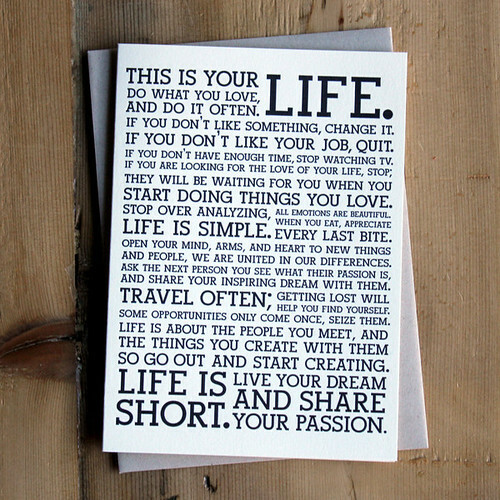 The sample shown above features the Holstee Manifesto, which was written by brothers Dave and Mike Radparvar and their friend, Fabian Pfortmüller as their definition of success when the three formed the company in 2009. Perry Nelson in Austin, Texas started Nicely Noted as she believes the convenience of having useful cards on hand encourages people to experience the art of letter writing and the sense of thoughtfulness and caring that results from sending a handwritten note. Three handpicked, letterpressed cards ($20/month) arrive packaged with envelopes inside cello sleeves. Postage stamps are included in a glassine envelope. Gift subscriptions start at $40/two months. 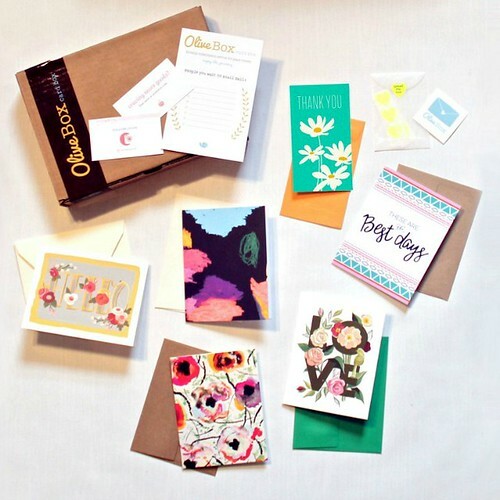 The OliveBox Card Box is a year-old subscription service from Grace Kang of the Pink Olive gift boutique in New York City and OliveBox subscription website. While the original OliveBox contains cards, artwork, inspiring books and small paper items, the Card Box is strictly greeting cards. Each includes six cards and twelve heart stickers at a cost of $25 bimonthly + $7.95 shipping. The website announces the theme of the upcoming Card Box - for example, May will feature wedding cards. I hope you've enjoyed this round-up and feel inspired to brighten someone's day by sending snail mail. It's always a treat to receive a handwritten note on a special card. If you have a favorite letterpress printer, you might check to see if they offer a subscription service as quite a few do. Thanks for featuring our Monthly Card Subscription! !